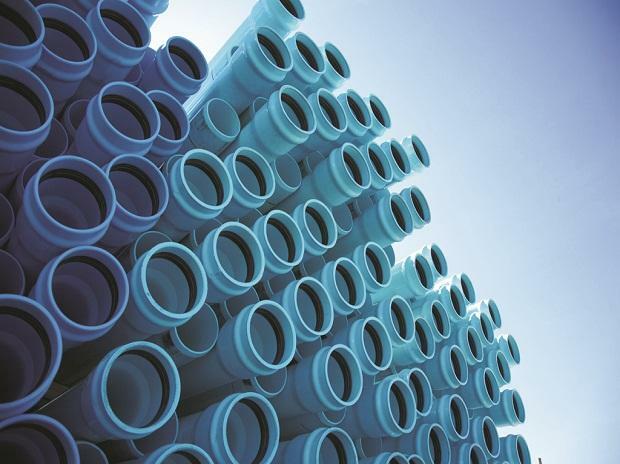 Following a downturn in December and March quarters, the demand of PVC (polyvinyl chloride) pipes has started reviving the past two weeks, and analysts are hoping that an upsurge in monsoon season offtake will improve the profit margins of manufacturers in the June quarter. Reflecting the revival in demand, share prices of leading players such as Finolex Industries (FIL), Astral Poly Technik (APT) and Supreme Industries (SIL) rose 8-15 per cent the past two weeks. Used primarily for supplying water from dams and canals to the field, the demand for PVC pipes normally jumps ahead of the monsoon, as they are critical for irrigating pre-kharif crops. Now, with the pipeline inventory lying with distributors getting gradually cleared, players are expecting a revival in demand during the April-June quarter, and a boost to their sales and profits starting in the June quarter. “Being a debt-free company, the downturn in demand has less impacted our business compared to our peers in the industry. Even during this downturn, we are the only players who take an advance for orders being placed by consumers. We hope the demand will slowly start picking up in the coming weeks as pipeline inventory is clear now. We believe demand is just waiting to explode and the full impact is likely to be seen in the June quarter,” said Prakash Chhabria, executive chairman, FIL. To make good of the situation, FIL is planning to invest Rs 40 crore on capacity expansion. The company is one of the country's largest PVC resin manufacturers and has an upper hand over its organised peers who don’t enjoy the benefits of backward integration. Currently, FIL has a captive consumption of PVC resin of 70 per cent, which assumes significance in an Indian set-up that faces a PVC shortfall of close to 50 per cent. The company operates through its three manufacturing plants in Pune and Ratnagiri in Maharashtra, and Masar in Gujarat. APT is another player that is planning to ramp capacity at Hosur and Santej and launch new products in both the segments amid expectations of a bump in sales in FY20. “The company maintained its margin guidance for adhesive and piping business at 13–15 per cent on the back of higher utilisation. Further, it is planning to add capacity to boost sales growth in FY20. We expect Astral’s revenue, EBITDA and profit to grow 19-21 per cent between FY18 and FY20,” said Sudeep Anand, an analyst with IDBI Capital. 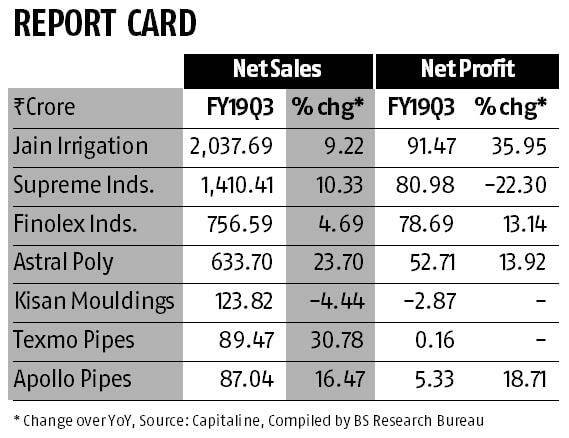 Supreme Industries Ltd (SIL) currently holds a 13 per cent share in the organised plastics piping segment and nine per cent in the pipe segment in India. In FY18, SIL's total capacity stood at 568,000 tonnes, of which piping systems made up nearly 80 per cent, while the rest was packaging and industrial plastics. “The organised sector has a 70 per cent share of the Rs 31,500-crore plastic piping industry in India. Six leading companies share 40 per cent of the organised market size,” said Akhil Parekh, analyst, Elara Securities (India). Declining input prices offer scope for a margin surprise in FIL's resin-making operations. Incremental brownfield expansion is also expected to aid return with a significant macro opportunity.